This year’s field day was spent in Yorkshire, based in the wonderful Ampleforth Abbey, and organised by Bede Howell and Graham Taylor. Discussion and woodland visits focussed upon natural regeneration and management of fine timber trees, especially Ash. The morning was spent on Sir Richard Storey’s Settrington Estate with forest manager Graham Taylor. The estate comprises about 218 hectares of predominantly broadleaved woodland. 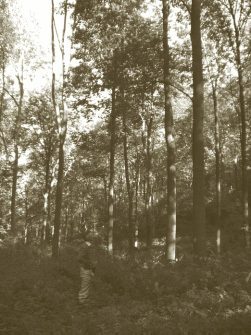 A quarter of this area was felled during World War II and rather than embarking on a programme of reafforestation with conifers, the estate focussed on growing quality broadleaves, with the use of conifers as nurse crops. This policy was illustrated at the group’s first stop, at a well-formed stand of 60-year-old Ash and Sycamore. Nursed by a crop of Larch and Scots Pine, the stand exhibited good form and vigour. Whilst this stand would undoubtedly have benefited from the considerable workforce of the past, the keenness of previous foresters to use local provenance seed has obviously played its part in producing such healthy stems. Indeed, Settrington Ash is well known by BIHIP members for its quality, and Graham Taylor is eager to maintain this reputation by using local seed when planting today. The group continued on to an adjacent compartment, and looked at a stand of poorer quality Sycamore and Ash which had been heavily thinned during the Second World War. The estate owner is not an advocate of clear felling, which means that here Mr Taylor is prescribing small group fellings in order to recruit natural regeneration. The proximity of this stand to the first raised an interesting discussion on the practicalities of seed stand registration. On quality grounds, the first stand is worthy of registration but its proximity to poorer quality trees raises issues in terms of pollen travel. An interesting debate ensued as to the distance of pollen travel, the use of buffers, and even the use of Norway Spruce as a sticky pollen trap ! The view of Dr Sam Samuel, the Forestry Commission’s reproductive material specialist, was that the stand could be registered, but that an advisory note should be made to highlight the risk of pollen contamination from poorer quality trees. 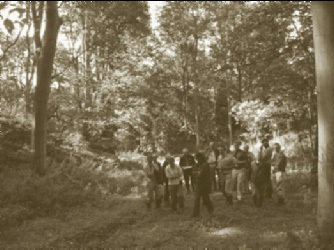 After a short walk, the group left the shelter of the woodland for the more exposed Damslack plantation – a three-year-old area of mixed woodland on the Wolds. Once again, the benefits of local provenance were brought home as we were confronted with some well-formed, and in some cases very vigorous Ash stems. They would be notable anywhere, but at 750 feet altitude, in 650mm rainfall and with little protection from exposure, they are particularly impressive. Settrington estate runs a successful wild pheasant shoot, which constantly impacts upon woodland management. Whilst the inclusion of Yew and a significant shrub component have been relatively easy to accommodate at Damslack, Mr Taylor emphasised that some other requirements of the shoot are far harder to meet. For example, the shooting and bird breeding seasons mean no woodland work between November and February and April and July. The potential loss of timber revenues due to felling out of season is a loss the estate has to bear. Graham Taylor has prescribed a first for the estate - interplanting the gaps with cricket bat Willow. Despite some people’s concerns about fungal and viral diseases a small trial area is deemed to be worth the risk considering that potential returns can be as much as £150 per stem standing. The last stop before lunch was a two-year-old compartment of Walnut, planted with the guidance of Gabriel Hemery, of the BIHIP Walnut group. The stand comprises several species selected to provide the Walnut with the shelter it requires. A shrub highly recommended by Dr Hemery is Elaeagnus umbellata which is a fast-growing nitrogen-fixing species originating from Eastern Asia. Thuja, Hazel and Field Maple had also been included as nurses. After a brief but refreshing lunch at the Arabian Horse in Aberford, the group headed off to Parlington Estate. Extending to some 522 acres, the estate is currently owned by Prudential Investments. Andrew Woods has been the forestry consultant since 1987. Recruitment of Ash natural regeneration is superb across the estate, with swathes of dense, vigorous seedlings occurring even in small canopy gaps. Indeed, almost all managed Ash at Parlington Dr Michael Carey in an Ash stand at Settrington. originates from natural regeneration – a stark contrast to Settrington where almost all stock has to be planted due to strong weed growth. The group’s first stop was a stand of 1940 Ash, which has done so well that it was the ‘Best in Show’ at the Great Yorkshire Show, 2004. Though this stand had attained a very high quality without pruning, today the estate does benefit from two full time forestry staff (one of whom, Shaun Taylor, accompanied the group), which means that all tending operations are carried out where needed. In terms of harvesting, Andrew Woods currently operates a single-tree selection policy which allows him to meet financial targets as required. At the second stop, Mr Woods showed the group some c.1986 Ash regeneration which had recently been respaced. The group was keen to forward advice on further thinning practices and a consensus was reached that the stand should be thinned again soon – something that pleased Shaun, who is keen to take advantage of a healthy local firewood market. Even at this stage the overriding feeling was that the stand is likely to be worthy of Forestry Commission registration before long. The last stop of the afternoon was a stand of 75 year old Sycamore. Although on first inspection the trees looked very variable, further exploration yielded two potential ‘Plus Trees’ for the BIHIP Sycamore group. The Irish National Council for Forest Research and Development (COFORD) has made a generous contribution of €15,000 to support the work of BIHIP for the current 2006/07 year, and they have kindly promised a similar amount in 2007/08. BIHIP members have interests beyond the genetic improvement of broadleaved trees. One of particular relevance is the likely effect of climate change on trees. Four of our members (Jeff Burley, Jason Hubert, John Fennessy and Jo Clark) met at an IPGRI/IUFRO (International Plant Genetic Resources Institute/International Union of Forest Research Organisations) meeting on forest genetic resources entitled “Climate change and forest genetic diversity: implications for sustainable forest management in Europe” in Paris, during March 2006. Of these four, Jo Clark, Forestry Research Manager at the Northmoor Trust, is currently investigating the adaptation of Ash to climate change for a PhD, based at Bangor University. Along the lines of the work carried out by the Fraxigen project (see WH Journal 2006, p. 22), she is establishing a series of reciprocal transplant experiments on sites from Inverness-shire in the north to Bordeaux in the south. If current climate prediction models prove to be correct, it is unlikely that our locally adapted native trees will remain as productive with the projected 3-5°C rise in temperature. A broader range of provenances may need to be incorporated into future plantings to ensure they are robust enough to cope with the predicated changes in climate. 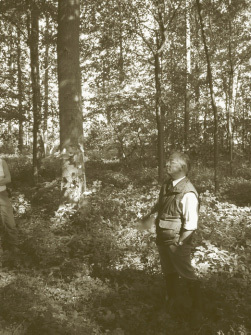 Norman Weiss, a former Trustee of Woodland Heritage, was the founder Chairman of the BIHIP Cherry Group, assisted by Karen Russell as Secretary. After almost 14 years Norman has decided to retire. During his tenure as Chairman, the Cherry Group became the first, and so far the only BIHIP Group to get any improved material onto the market (the ‘Wildstar’ collection of clones, developed by East Malling Research). He will be much missed. His successor is Rik Pakenham, a forestry management consultant who is based in the Chilterns, but operates in much of the South East of England. Rik has been a member of the Group almost since its inception and is well placed to take over the leadership. As a parting gift to BIHIP, Norman Weiss very generously paid for a study by Oxford Forestry Institute-based Dr David Boshier on scientific facts behind the misconceptions and perceived negative impacts on biodiversity of tree improvement activities. It is hoped that this will act as a guide to policy makers and ecologists, as well as those who support the activities of BIHIP and WH. Thank you so much for your cheque for BIHIP. As you know very well, continuing and generous support of BIHIP is invaluable and absolutely vital to our work. This year it will be used for a number of projects, but particularly to support Gavin Munro in his attempts to locate ‘Plus Trees’ of Sycamore, Oak and Ash throughout Britain and Ireland. It is largely through Woodland Heritage’s initial support that BIHIP got going at all. Your contributions have acted as ‘pump primers’ for others, especially the Forestry Commission who now give us an annual grant. Though our annual income is very small in comparison with the total costs of the work done in the name of BIHIP, Woodland Heritage has enabled us to do some things that could not be funded in any other way. As a point of accuracy, BIHIP has not received charitable status. We have actually set up another organisation, the British and Irish Hardwoods Trust (BIHT), which is the charitable arm of BIHIP. It is BIHT that is the charity.